The skin of the hand is very delicate and since they are always in direct contact with drying elements like detergents, hot water, harsh sun etc, they age quickly, sag and look rough and chapped. Here are a few tips on how to take care of your hands. The condition of the hands depends on the care you give them. The skin on the back of the hands is soft and thin and prone to early wrinkling, whereas the skin on the palm is thick and tough. The palm has no sebaceous glands, thus no natural lubrication thus they can become dry and rough. Eat a well balanced diet to get that shine on your nails. 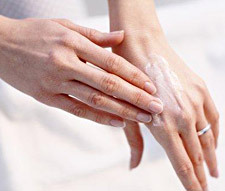 Apply hand cream after putting your hands in water; also as extra treat for them at night apply a good moisturizing cream. Use an oily enamel remover, as this will prevent moisture loss from the nail plate and stop your nails drying out. Have regular manicures to maintain your nails. Wear gloves to protect your nails from detergents and chemicals, e.g. washing up gardening and the housework. Don`t wait for polish to set. To speed-dry, run your nails under cold water-not a blow-dryer-for three minutes after applying the final coat. Cold hardens enamel faster than heat can. Never trim you nails right after taking a shower or bath. Water softens nails and makes them shred during clipping. Clench your fists tightly for a second and then throw open the fingers as wide as possible. Place hands in front of you, palm down. Press the fingers tightly against each other and then thrust them apart as widely as possible. Allow the hands to be limp and relaxed. Then rotate them from the wrist in circles, first clockwise and then anti clockwise. You can also give an instant refresh treatment to your hands at home by soaking your dry hands in warm olive oil. Fill a teacup with the warmed oil, dip in your fingers and let them soak for a few minutes. When you remove them rub the oil into your hands and allow as much of it as possible to be absorbed before rinsing away the excess. Alternatively, you can smother your hands with rich cold creams.